WARSAW, Poland (CNS) — Austria’s Vienna Archdiocese will press ahead with a major reorganization that will including liquidating most of its parishes over 10 years, despite objections from some local Catholics. The archdiocese’s 660 parishes will be merged over the next decade into around 150 larger parishes, each served by three-five priests and offering regular Masses. Pruller told Catholic News Service that falling numbers of clergy and laity had necessitated the changes. He said smaller affiliated communities within the parishes will be run by lay volunteers authorized to conduct the Liturgy of the Word. Pruller said archdiocesan bishops would draft the new parish boundaries and steps for implementing the reorganization by Jan. 1. “As society changes, the church has to change its old-fashioned practices and structures, too,” he said. “This is about a new cooperation between priests and laity from their common Christian vocation,” the cardinal told the news conference, which was reported by Austria’s Kathpress news agency. “We have to free ourselves of the traditional image that the church is present only where there’s a priest and stress the common priesthood of all baptized,” he said. He added that it would not alter the ratio of priests to lay Catholics and said other dioceses in France and Germany had also made “groundbreaking structural changes” and retrained their parish teams. 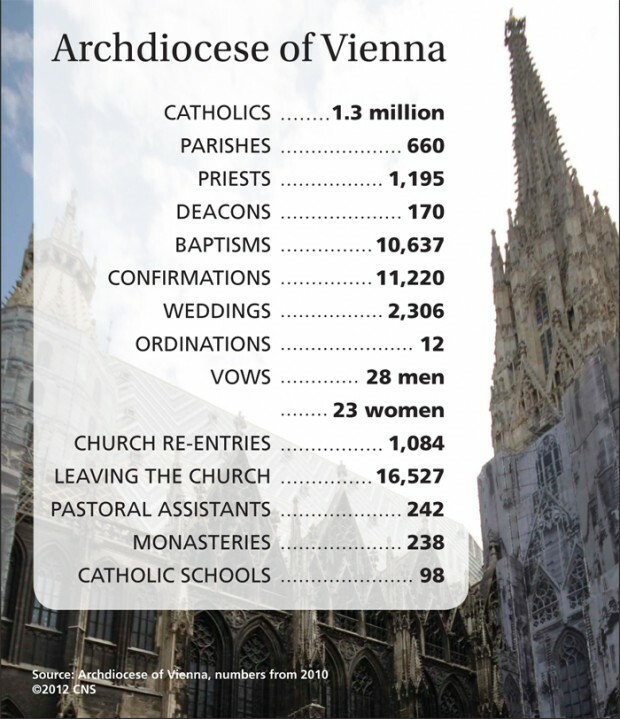 The reform was supported by several Austrian newspapers, including the mass-circulation Die Presse daily, which said in a Sept. 24 editorial it was “not only understandable but imperative” to centralize parish work. However, a leading pastoral theologian and sociologist, Father Paul Zulehner, said the reform had been opposed by most Catholic respondents in an online survey, to be published Oct. 31. “Although there were consultations, they weren’t held with the priests and laity who’ll be most affected — this isn’t a good way to restructure an archdiocese,” Zulehner told Catholic News Service. The Austrian Priests’ Initiative, which currently claims 508 clergy members, pledged to resist the reorganization. A statement from the head of Austria’s lay Catholic “We Are Church” group, which has campaigned for changes since 1995, said it doubted downsizing would facilitate greater lay participation.